You had to figure that it was only a matter of time before I showed up here with a peanut butter and jelly cupcake, right? I honestly can’t believe it’s taken me so long. If only my little 5-year-old self had been introduced to these… oh boy. I don’t think she would have ever eaten another thing. It would have been a nightmare for my mom, for sure. It’s a good thing I was a responsible adult (who still, at times, sustains herself with only peanut butter and jelly) before I discovered these beauties. 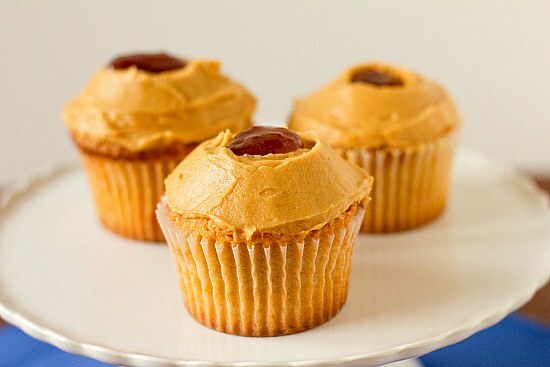 I’ve had them bookmarked forever in my cupcakes book, but they sat on the back burner of my mind for some time before a reader asked a couple of months ago if I had a recipe for peanut butter and jelly cupcakes. As a card-carrying member of the peanut butter addict club, I was slightly ashamed that they weren’t already nestled in a cozy little spot on the site. I’m happy to say that they now their spot. Too bad I don’t still have my old peanut butter and jelly sleeping bag I used as a kid – what an appropriate way for peanut butter and jelly cupcakes to cozy up! The cupcake base tastes almost exactly like a peanut butter cookie – lovely, moist, and dense with pieces of chopped peanuts studded throughout. If you closed your eyes and ate it, you might think you were eating a peanut butter sandwich. With a bit of cake-like texture, of course. Throw on peanut butter frosting and a healthy dose of strawberry jam (you can use your favorite flavor – jelly or jam) and you have a peanut butter and jelly sandwich. In a cupcake. Which is every kind of awesome. 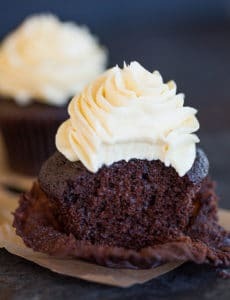 The frosting for these cupcakes is very, very similar to the peanut butter/cream cheese mousse filling that is used in the Chocolate Peanut Butter Torte (one of my all-time favorite desserts and my Chief Culinary Consultant’s favorite birthday dessert). 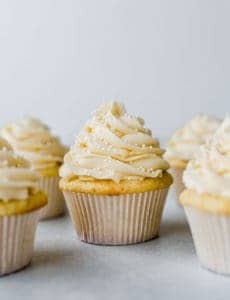 You mix together cream cheese, peanut butter, and powdered sugar, and then separately whip cream to medium-stiff peaks and fold it into the peanut butter mixture. The result is a rich, smooth, mousse-like frosting that spreads on like a dream. Carve out a little nest in the top and drop in your favorite jam or jelly. Share some, and hoard some. Then proceed to eat at least one a day until they are gone. Oh how I wish there were still some left! A favorite flavor combo in cupcake form! Preheat oven to 375 degrees F. Line standard muffin tins with paper liners. Whisk together the flour, baking soda, baking powder, and salt. With an electric mixer on medium-high speed, cream the butter and sugar until pale and fluffy. Reduce speed to low and mix in peanut butter. Add the eggs, one at a time, beating until each is incorporated, scraping down the sides of the bowl as needed. Mix in the vanilla. Gradually add the flour mixture; beat until just combined. Mix in the sour cream and peanuts. Divide the batter evenly among the lined cups. Bake, rotating the tins halfway through, until golden and a cake tester inserted in the centers comes out clean, about 22 minutes. Transfer tins to wire racks to cool completely before removing cupcakes. Cupcakes can be stored up to 3 days at room temperature in airtight containers. Make the Frosting: With an electric mixer on medium-high speed, beat cream cheese and powdered sugar until pale and fluffy. Add the salt and peanut butter, and beat to combine. Beat in vanilla. In another bowl, with an electric mixer on medium speed, whisk cream until medium-stiff peaks form. Fold the cream into the peanut butter mixture. use immediate, or refrigerate, covered tightly, up to 2 days. Before using, bring to room temperature and stir with a flexible spatula until smooth. To finish, use an offset spatula to spread frosting over each cupcake, leaving a small well in the middle. Dollop about 1 teaspoon jelly into each well. Frosted cupcakes can be refrigerated up to 1 day in airtight containers; bring to room temperature before serving. I’m not much of a baker but I decided to give your funfetti cupcakes recipe a try as I really wanted some. Those turned out great and it was such a great recipe. That recipe led me to this great pb&j recipe. 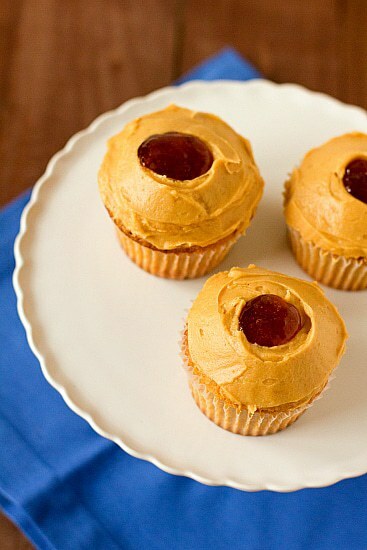 PB&J is my all time favorite snack so of course I’d want it in cupcake form! Everything turned out pretty well. However, I slightly modified the recipe to inject strawberry/grape jelly (and chocolate for a few of them!) into the cake and then dress the cake in the peanut butter icing like a standard cupcake. Then I drizzled the jelly/chocolate on the icing. I wanted the peanut butter/jelly proportions to be more in line with a standard pb&j sandwich so i decided on those modifications. Everyone at work loved them so thank you for this great recipe! Can i omit the peanut butter for the batter? You really can’t. 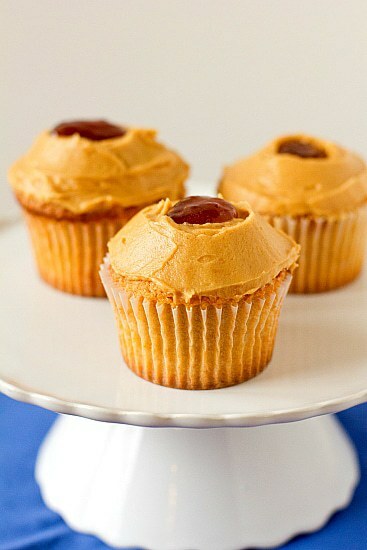 Aside from no longer being a peanut butter and jelly cupcake, it would throw the texture of the cupcakes off. 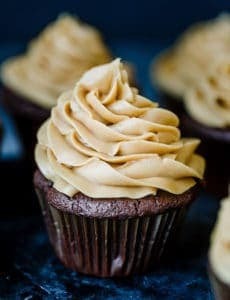 I would just go with a plain vanilla cupcake if you don’t want a peanut butter cupcake. 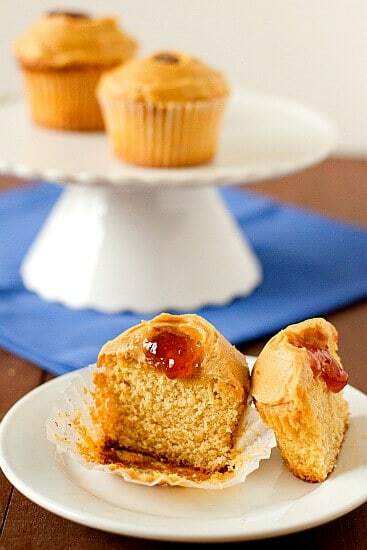 What if you drop only half the batter in your muffinpan, add a dollop of jam in the middle and then fill to the top. Ive done it with other cupcakes before. So theres a surprise baked right into the middle of the cupcake. How would yoi make this into a cake version? Is it juat time amd temp? Or nees to add additional amounts of certain’t ingredients? The BF loves PB&J, so thought I’d make this as his bday cake :) Thanks! Hi Alani, I would reduce the oven temperature to 350 degrees F and use 8-inch round pans if you have them. As for time, I would start checking around 22 minutes just to be sure you don’t over bake them. Oh my god these look AMAZING! And very cute! Yummy looking. Why didn’t I think of this? 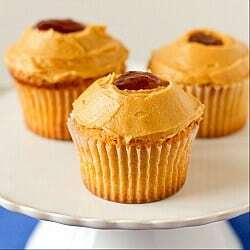 I had a peanut butter jelly cupcake from a local baker and I fell in love with the cupcake combination. I have to try these. Thanks! Amazing cupcakes….!!! That combination of peanut butter and jelly is wonderful.